As a simple first Arduino experiment I interfaced a two line LCD (a Displaytech 162B) and an LM35DZ to make a simple Min/Max thermometer. This is really very simple. The LM35DZ has three pins, +5V, ground and a variable voltage output to indicate the temperature. I plugged it into breadboard and wired the output straight to the Arduino's analogue input 0. To test we can run a program to read the sensor, do the conversion to degrees celcius and then output it to the serial port (since we don't have an LCD quite yet). Remember to use the arduino IDE's serial monitor to look for the output when run - it won't appear unless you select it! The Displaytech 162B is a HD44780 compatible device, and it's easy to find guides on how to interface them with the Arduino. They can be driven with a eight data lines - which uses up most of the digital I/O pins on the Arduino, or more sensibly you can use 4 bit mode. I started with 8 bit mode, and whilst it worked it's so trivial to use 4 bit instead it's not worth the extra wires! I also couldn't get both lines of the display working in 8 bit mode. The other two pins of the potentiometer are connected to +5V and GND and provide a contrast control (and you will need it at least initally). 50K is over the top for the purpose, 10K is more typical, but it isn't an issue. The resistor on the backlight was added because the backlight LED on the board was getting rather warm. The display stays bright enough and runs a bit cooler with a resistor on the supply. The pin allocations on the Arduino were dictated by the LCD4Bit library, but you could easily change them in the library if you needed to. 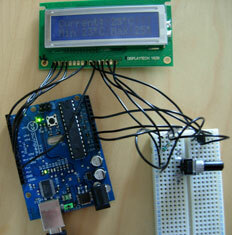 You can take the test code and library straight from the Arduino Playground 4-bit LCD page. 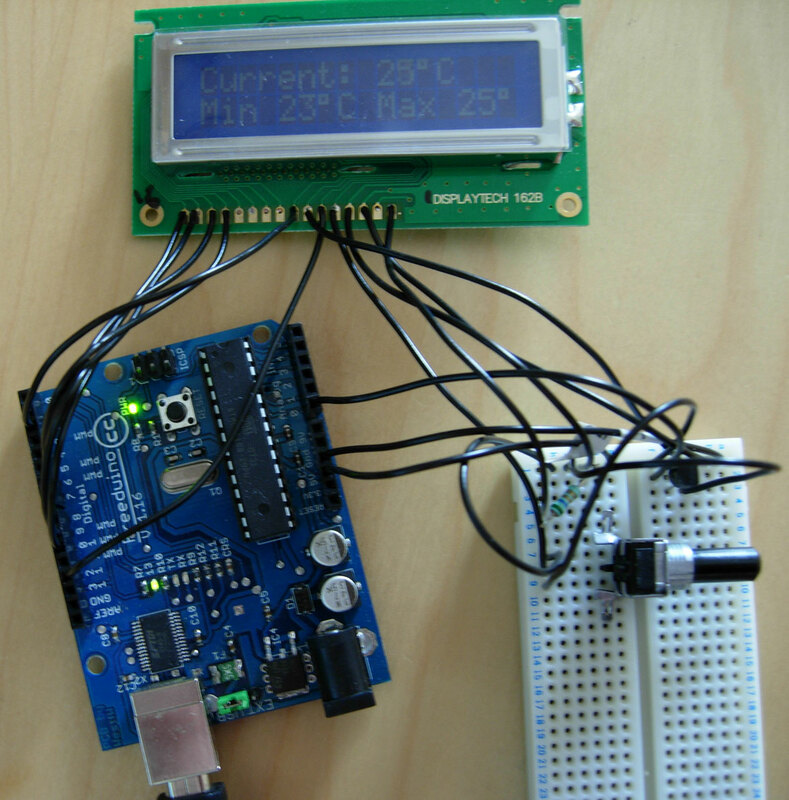 Run it and verify your LCD is printing "arduino" as the program runs - you will probably need to twist the potentiometer to get a readable display. fixes an issue in the libraries supplied with my installed version of the dev kit, you may not need it. The LM35 has an 0.5°C accuracy which we're not displaying - if with a few changes we could. We could add multiple sensors, especially by using Dallas 1-wire sensors. Last modified on: Sat Jan 30 09:55:25 2010 N.T.K.